After more than two decades of homeschooling, our family has a long list of things we love about learning at home. It’s our lifestyle and sometimes we take it for granted that the rest of the world does live like we do. Now and then we’ve had someone insinuate we force our children to be here against their wishes so I took a poll asking them what they loved about homeschooling. If ever you were concerned, read through our list to see how they really feel. Oh, and if you are not a homeschooling family? Try not to be jealous! It’s allows for flexibility -kids can enjoy time with Dad on his days off. They can work hard to finish early & have time to play. We can set our own schedule. The children can enjoy visits from grandparents or take off days for spring break when the weather really is springlike. Book work can be set for the times we are most alert or when younger siblings are napping. We are able to tailor our learning to fit each child’s needs, interests & personalities. We’ve been able to choose what and how we want to study, and what order we want to tackle different subjects. If a child struggles with math concepts or reading lessons we can slow down until they ‘get it’ or if they easily master them we can move on to the next phase without bogging down and getting board. At the high school level have the freedom to to focus on classes that meet their longer term goals and equip them with life skills. Vacations are educational field trips and we can take them on our own time table, not when everyone else is taking them! All of the children commented on vacations we took and things they learned along the way. Not only do we learn along the way, we get better rates and deal with fewer crowds because we can plan our trips when everyone else is in school and back at work. Homeschooling is more efficient. I’ve read that 20 minutes of one-on-one teaching is equivalent to 1 hour of class room teaching. This explains why our children can be finished with lessons early in the day, with time to pursue interests and community service and hobbies. We can visit the park when it is not crowded. Picnics and impromptu ball games are so much more fun when we have room to sit and roam. Sharing Park Days with our fellow homeschooling families has definitely been a homeschooling highlight over the years. The family learns together. When we gather around the table conversation is easy because we’ve been learning and working together. We understand it’s been a tough day or a great day and we can all share in that. Younger children learn from older children. Older siblings learn from younger siblings. Having the opportunity to work things out as a family, enjoying the good things and working out the tough things, goes a long way in preparing the children for life. You can wear your pajamas to school, and that’s ok when the other students and even the teacher might be wearing theirs, too. Your children will be top of their class! Valedictorian! They can choose their school colors and their own mascot. When each of our children graduate from high school they get to choose their class colors and what type of ceremony or celebration they’d like. You can even name your own school! 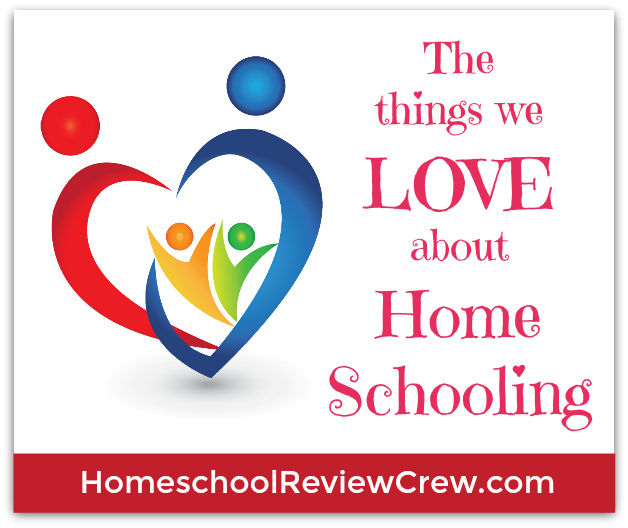 I’m sharing this post as a part of the Homeschool Review Crew Things We LOVE About Homeschooling Round Up. There are many others sharing their love of homeschooling with us, there. I hope you’ll visit and see what inspiring ideas they have to share! But, what if your detractors were right, and you DID compel your children to school at home? That still wouldn’t make it a bad choice, or bad for them. We compel our children do do things they don’t want to do all the time, if we believe it is in their best interest. Brushing teeth, going to bed, choosing a healthy diet, using good manners and being kind are ALL things we sometimes insist our children do, even if they don’t want to. And the State FORCES Public School children to attend – does that mean that we can assume that all public school must be bad? Thanks, Anna. Every parent has the God-given authority and responsibility to raise their children, including how they are educated. In some places the State has taken on that authority. We as parents still must choose. I am very grateful my family has been able to live in places where we have may options, and the option we have chosen has been to educate at home, in a mostly non-traditional style. The things listed in this post are things our family has enjoyed and ways in which we’ve benefited. Other families choose a different way. Their list will look very different from mine. I did not mean to attack or offend, just share from my experience. Love all your reasons! That flexibility is so important as it allows me to spend more time with my husband AND with my mother. I’m very thankful to be able to homeschool. Thank you, Kemi 🙂 The flexibility of our homeschooling lifestyle really is beautiful. I’m glad you get more time with those important people in your life! i love the comments of the grandkids. 🙂 . Visiting from things we love roundup. Hi Annette 🙂 It is so much fun to see my children raising their own families, watching them build on all those years of their own homeschooling journey. Thanks for stopping by for a visit today! These are most of our favorite reasons too! Pinned.